Three complete semi-automatic dissolution testers including media preparation and vessel cleaning - this is the amount of floor space you can save with a RoboDis II 10-batch system, which has a footprint of no more than 2x1 m. With the RoboDis II the complete dissolution process can be automated. 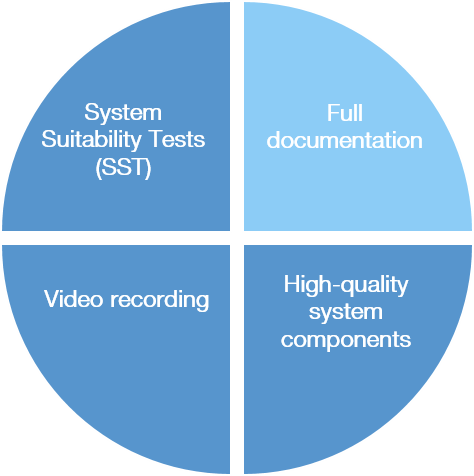 This way, fully automated testing, including setup, media preparation and automated cleaning process is possible. RoboDis II - unique & fully automated. 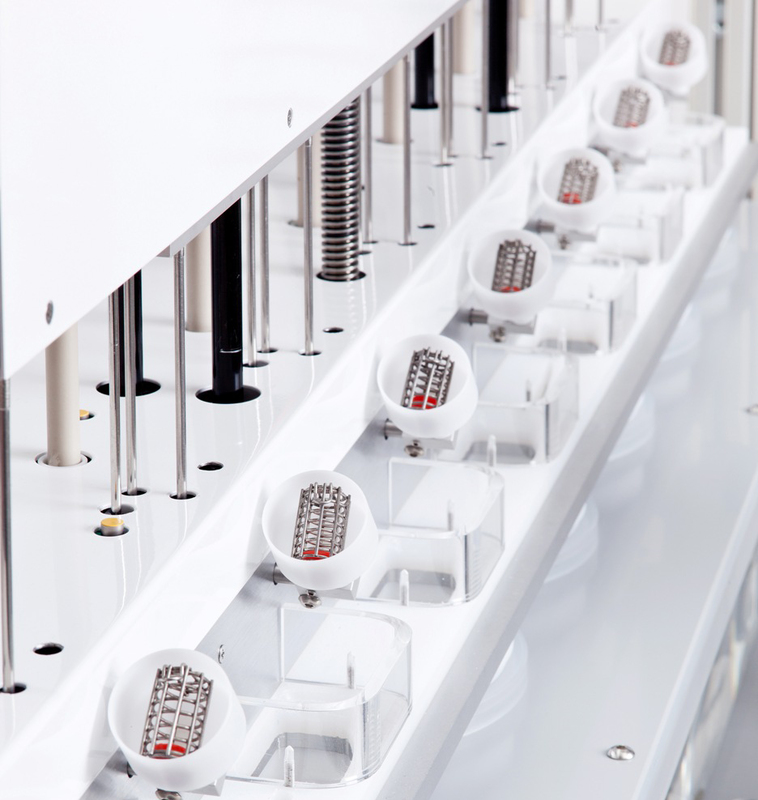 RoboDis II is the only parallel-working, fully automated dissolution test system currently on the market. All stages of the dissolution processes are computer-controlled and therefore carried out entirely without user intervention. 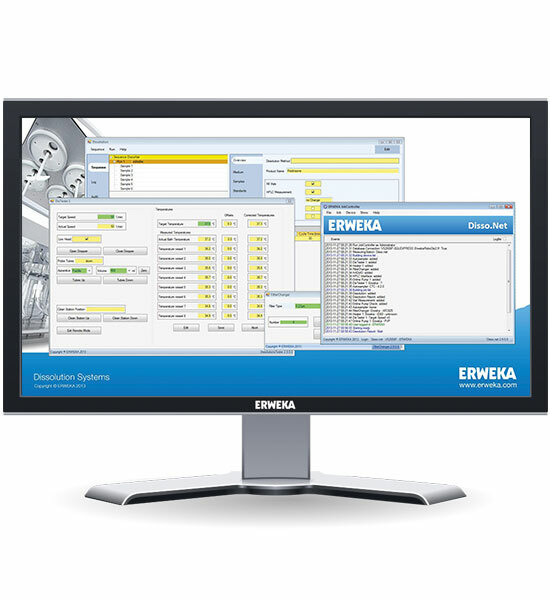 The key element of the fully automatic system is the Disso.NET software developed by ERWEKA, which handles all system functions, including the precise movement of the robot arm, control of the analytic devices, data processing and full documentation. 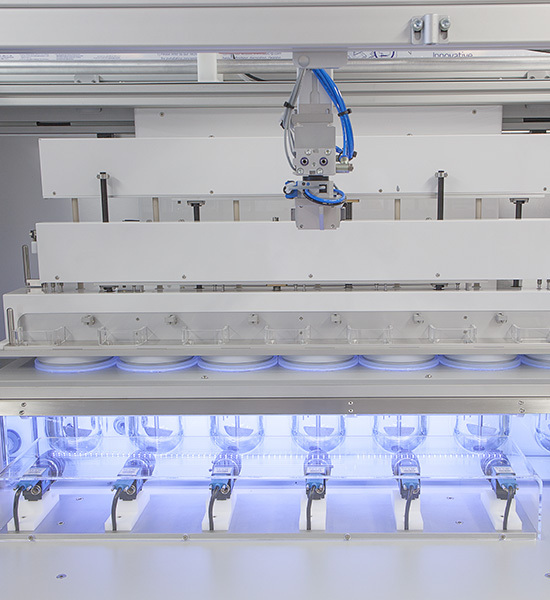 In the standard configuration, RoboDis II tests up to 10 batches in accordance with USP methods 1 (Basket) or 2 (Paddle). 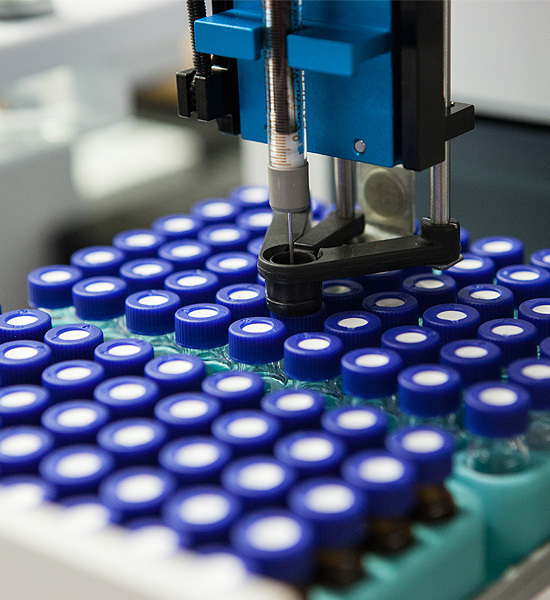 The parallel sampling approach enables very short cycle times for recording of detailed drug release profiles to be selected by the user. 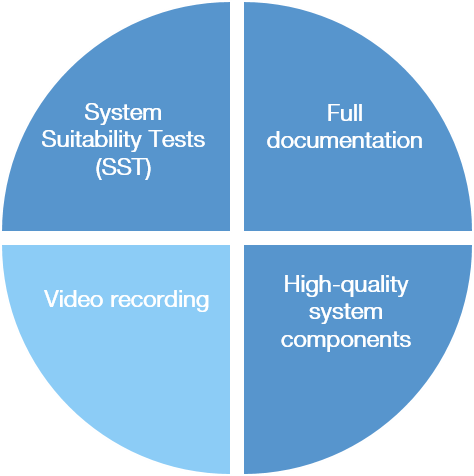 Integrated System Suitability Tests (SST) and video monitoring ensure a high degree of reliability. Like all ERWEKA products, RoboDis II is fully USP/EP/JP compliant. 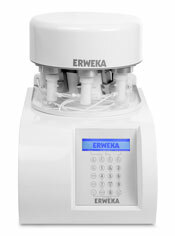 Advanced dissolution system with a broad range of functions. Innovative RoboDis II safety systems. RoboDis II performs routine tasks more precisely than any human operator – but without a human operator all its powerful fully automatic features would be worth nothing. It is the human operator who defines the test methods, checks results for plausibility and interprets the data obtained. To enable him or her to focus on these tasks, we have equipped RoboDis II with a number of safety features. 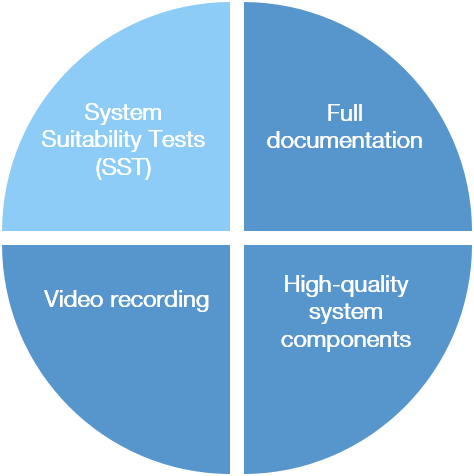 In each individual process step, RoboDis II self-checks by means of integrated System Suitability Tests (SSTs). Several built-in light barriers validate the steps performed by Robo Dis II, thus preventing false starts. Each step of the test is logged in accordance with the industrial standard 21 CFR Part 11. 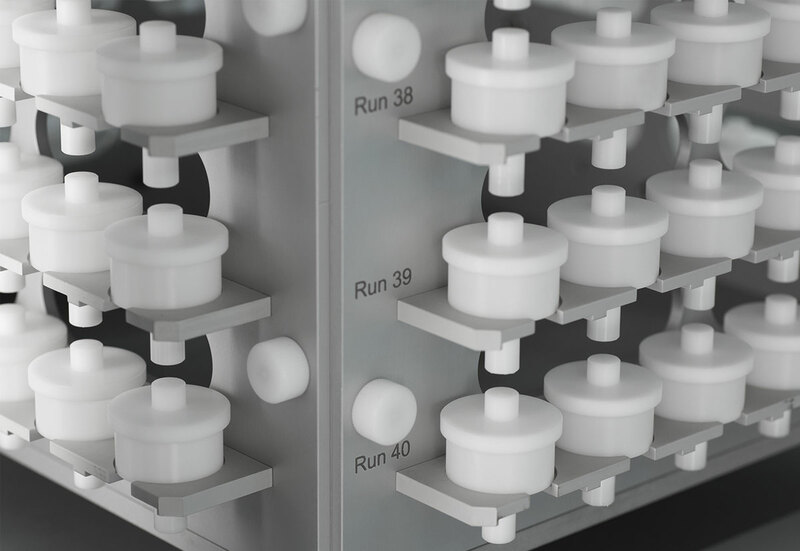 This will enable you to check, for example, whether RoboDis II actually did test all 40 batches completely over the weekend. 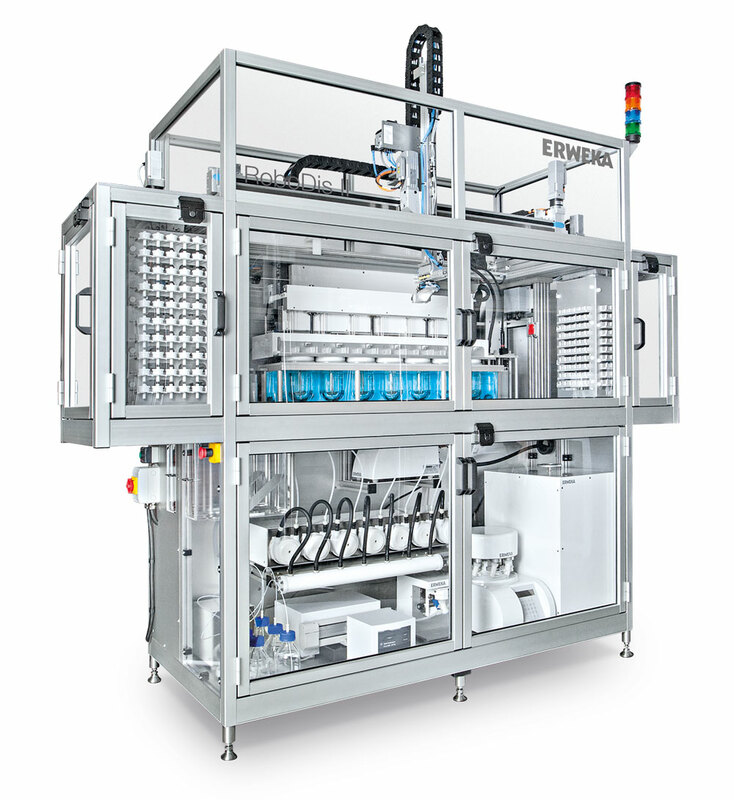 RoboDis II is built with tried-and-tested, reliable system components, amongst them, e.g., ERWEKA’s maintenance-free PVP pump and the robot arm made by the internationally renowned pneumatics manufacturer Festo. 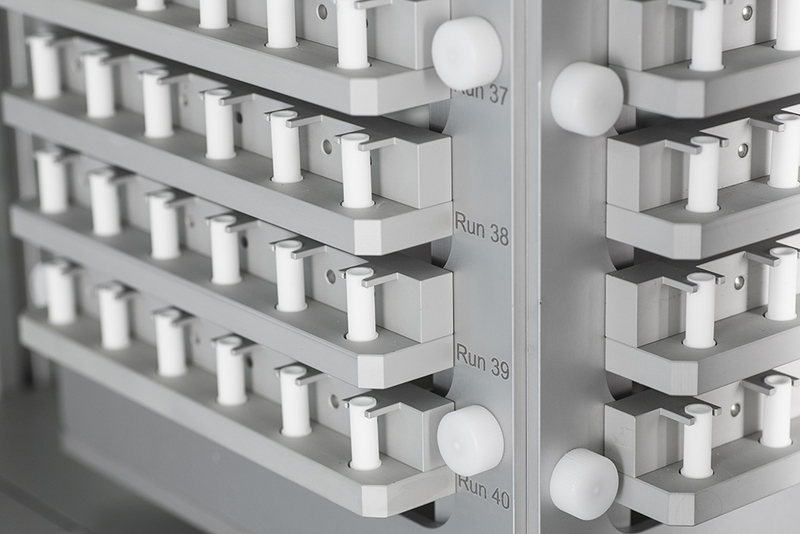 The use of premium components guarantees maximum precision and lowest downtimes. 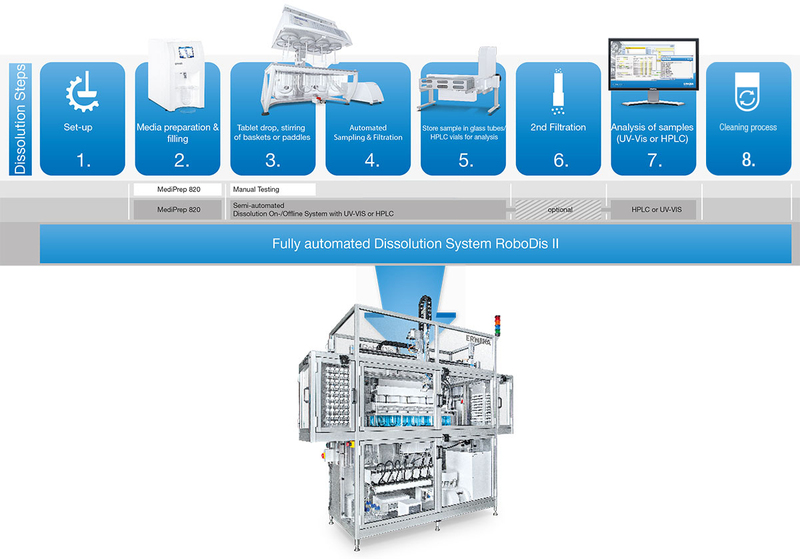 RoboDis II optionally records the entire dissolution process with six integrated video cameras. 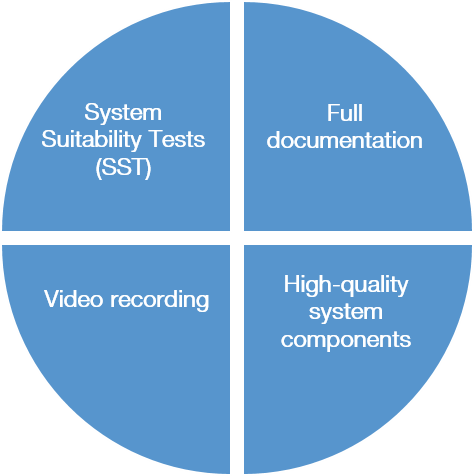 This allows validating the entire test upon completion, or overlaying the dissolution curve on a time-lapse video recording. 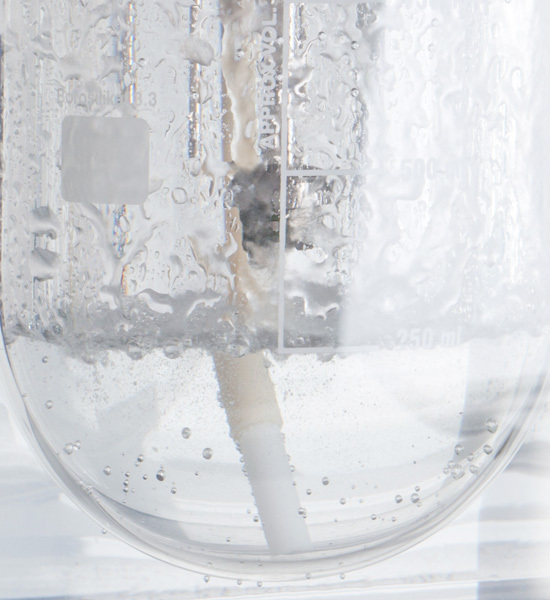 Thanks to the LED light strip the water bath can be illuminated at night, allowing 24 hour video recording without the need for external lighting. The key element in the RoboDis II system. A user-friendly editor enables the required dissolution test methods to be defined and started. Disso.NET then manages all steps of the dissolution process from media preparation through to analysis. 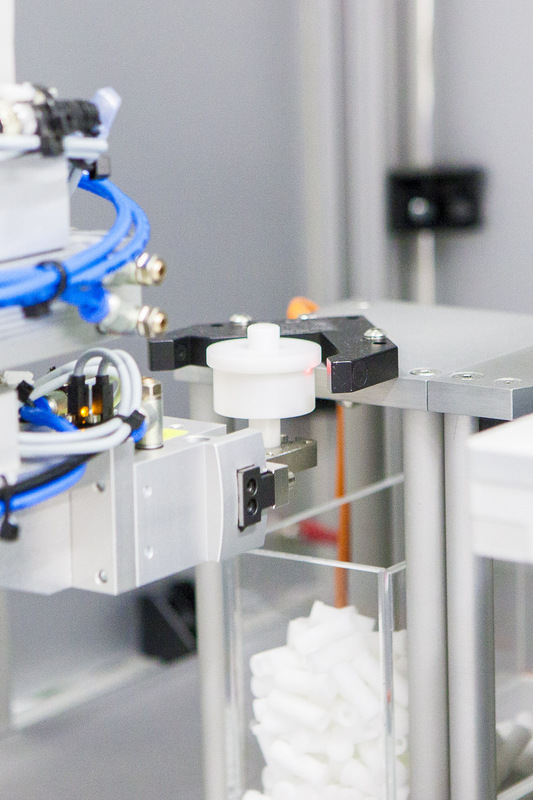 The software also controls the precise movement of the robot arm and the connected analytical devices. Disso.NET logs all test results and times, and automatically creates an audit trail. Upon completion of the test, the software generates extensive reports and enables export of all test results. 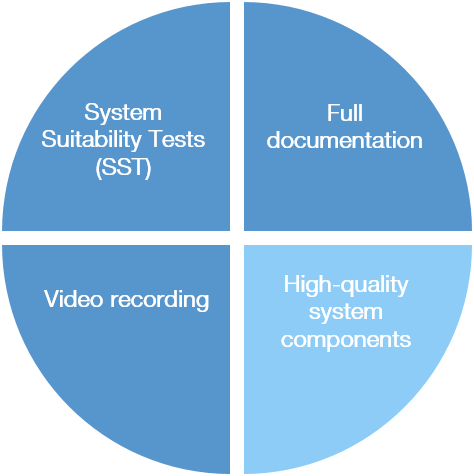 In addition, the software controls the System Suitability Tests and the video recording functions. Thanks to the newly developed LED light strip, the water bath can also be illuminated at night and thus allows 24 hours video recording without the need of external lights. The LED light bar is very energy efficient and offers the perfect brightness for our new gigabit Ethernet camera system. The RoboDis II supports up to six of these new cameras which are simply connected to the controlling PC, using the already established Ethernet network connection inside the RoboDis II. Perfect for high volume testing. 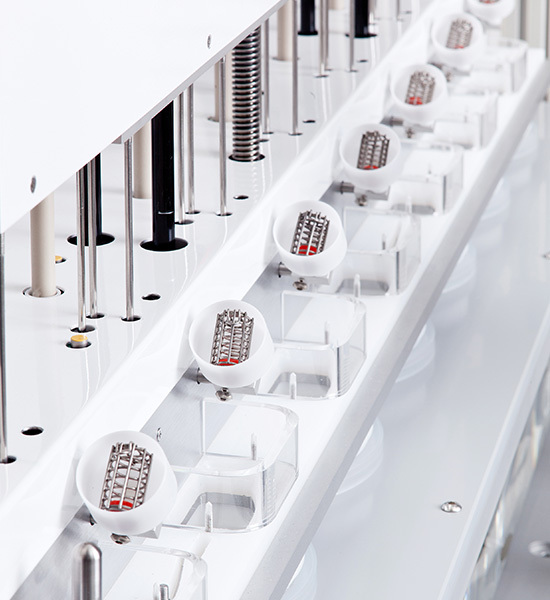 Our newly developed 40 batch magazine for RoboDis II allows fully automated testing of up to 40 batches of samples. 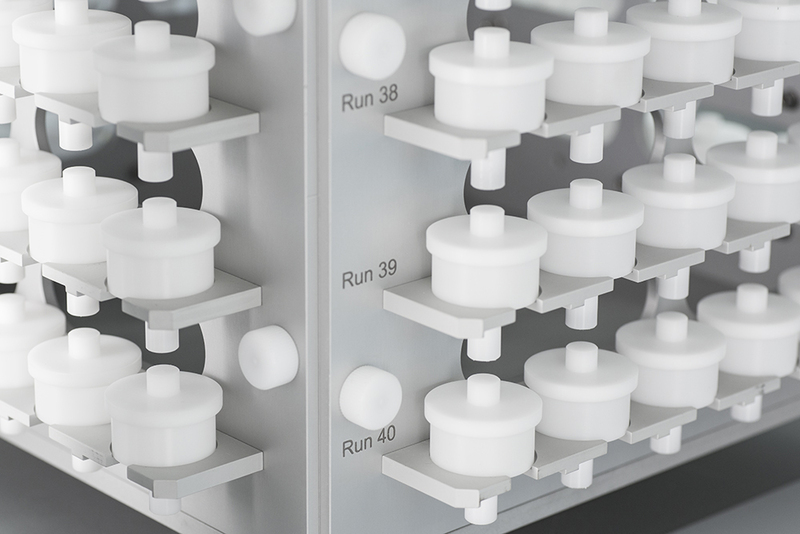 In addition to the 40 batch sample holder, the RoboDis II also offers a 40 batch filter holder. In combination with the LED Light bar, the RoboDis II is now able to continually test samples 24 hours/7 days a week. Central to RoboDis IIs testing procedure is our advanced, pneumatic robot arm. 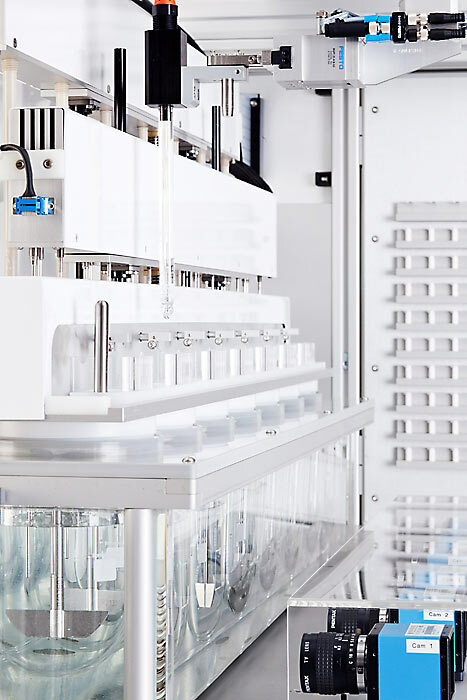 This arm assembles all samples, adds and removes filters and is even responsible for filling and cleaning of the vessels, saving the operators tremendous amounts of time for doing those repetitive tasks. 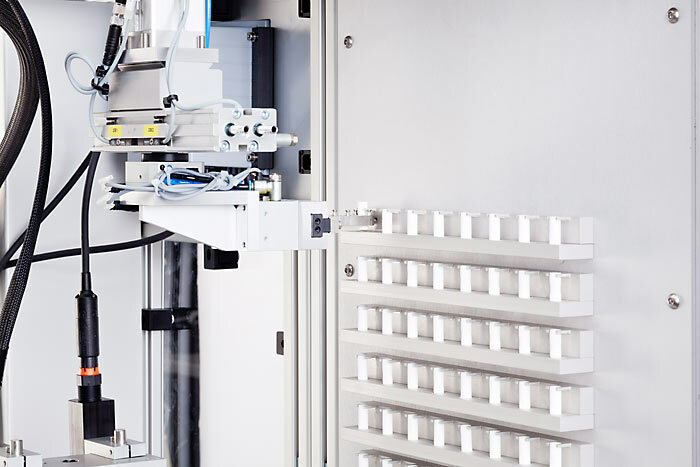 In the 40-batch version, RoboDis II enables true 24/7 testing and is capable of handling 40 batches without human intervention. Optional pH measurement permits pH changes according to USP Method A (half change) and Method B (full change). 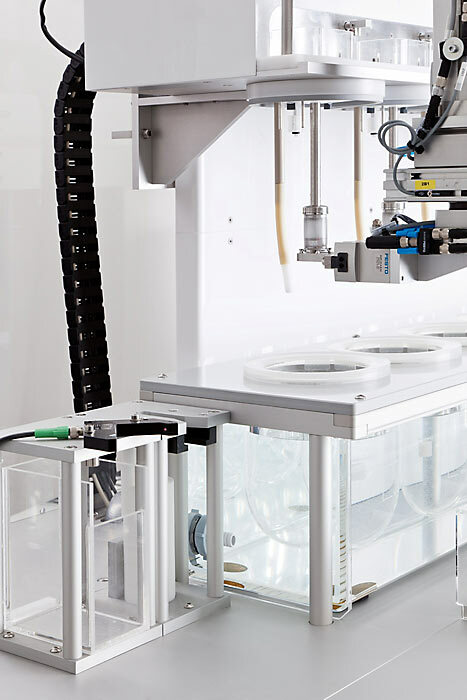 Poroplast filters are fitted fully automatically for each test by the robot arm. The built-in media preparation feature fully automatically prepares the medium for the testing procedures. Media preparation is configured through the Disso.NET software, with RoboDis II taking care of all other steps. 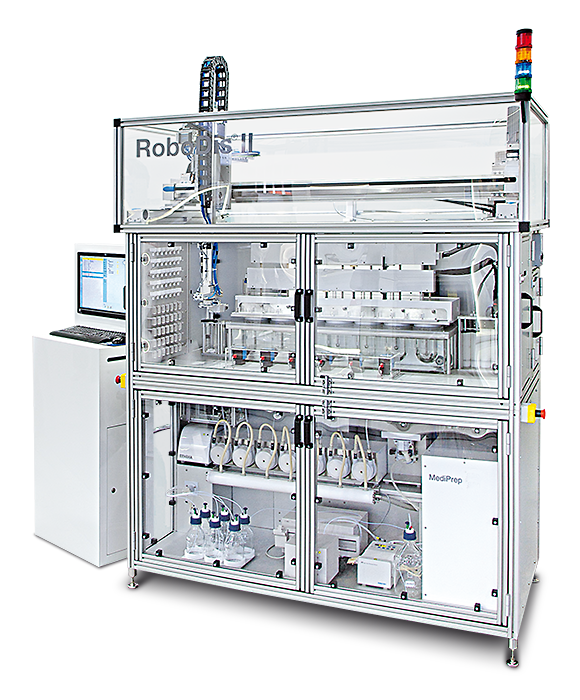 RobDis II supports integrated online UV-Vis or HPLC analytic devices. 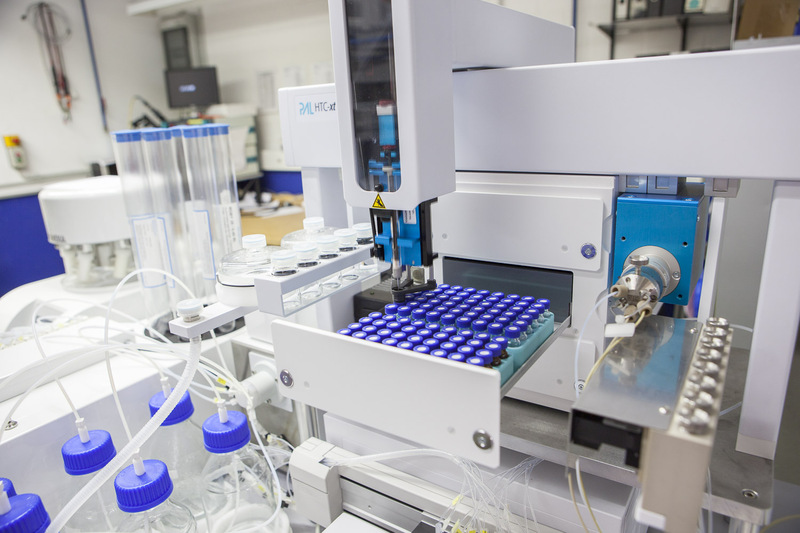 Samples are withdrawn fully automatically and transferred to the analytics devices. 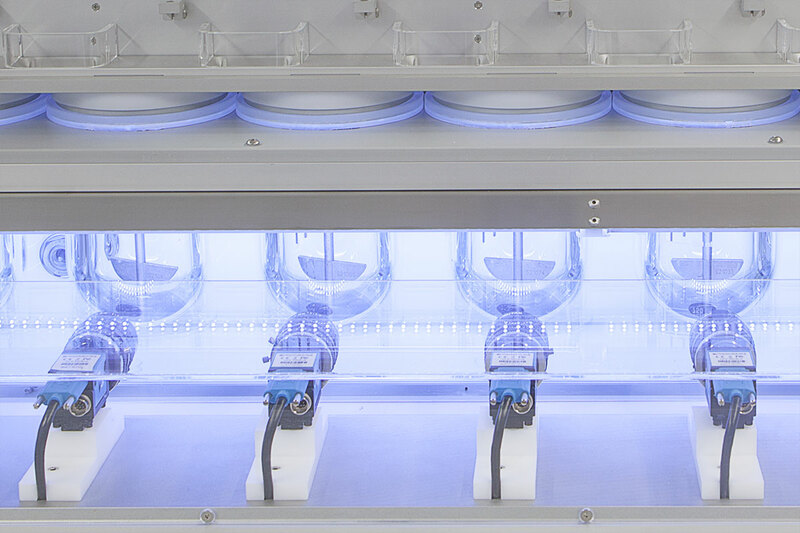 Seven USP-compliant test vessels in the RoboDis II system support testing in R&E and in quality control. In quality control, for example, six samples may be compared to a reference sample. Alternatively, seven different samples can be tested in parallel for Research & Development. 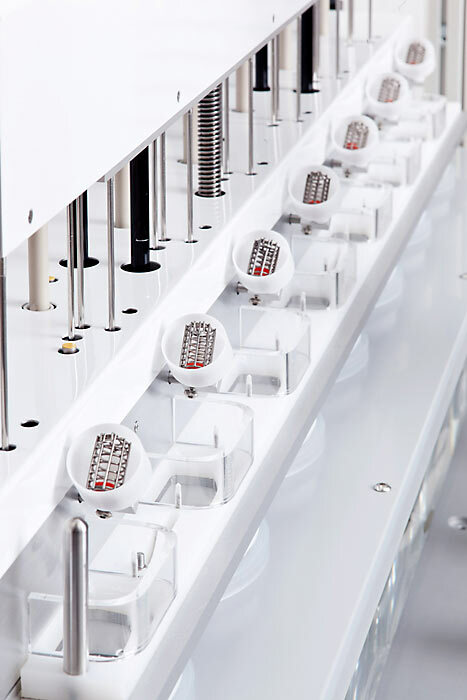 The highly precise piston pump with ceramic heads is virtually maintenance free and ideally suited to the high sample volumes handled by RoboDis II. RoboDis II supports the use of both paddles (USP 2) and baskets (USP 1), both of which can be exchanged by the user. Moreover, it supports the use of sinkers measuring up to 34 mm. Dropping and removal of sinkers take place fully automatically with the sinker tool provided. 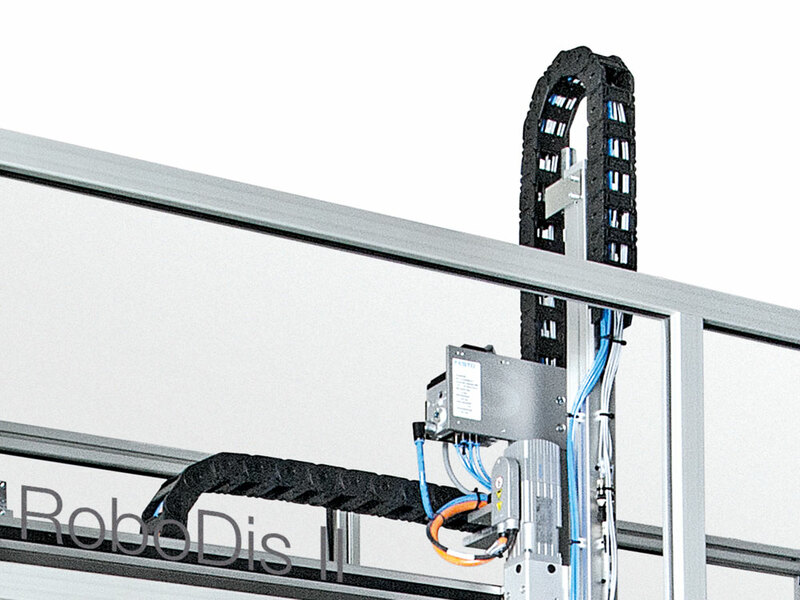 RoboDis II is equipped with 6 video cameras and a LED light strip. The water bath can be easily illuminated and the new video capturing capabilities can be used without the need for external lights. 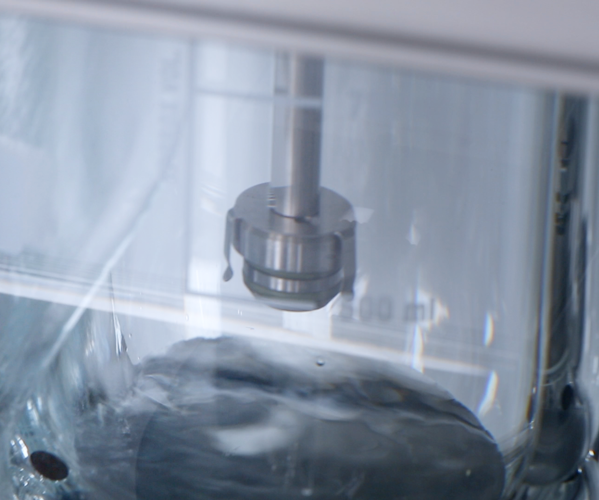 In addition, video recording of the dissolution process in time-lapse mode is possible. Premium service for a premium product. 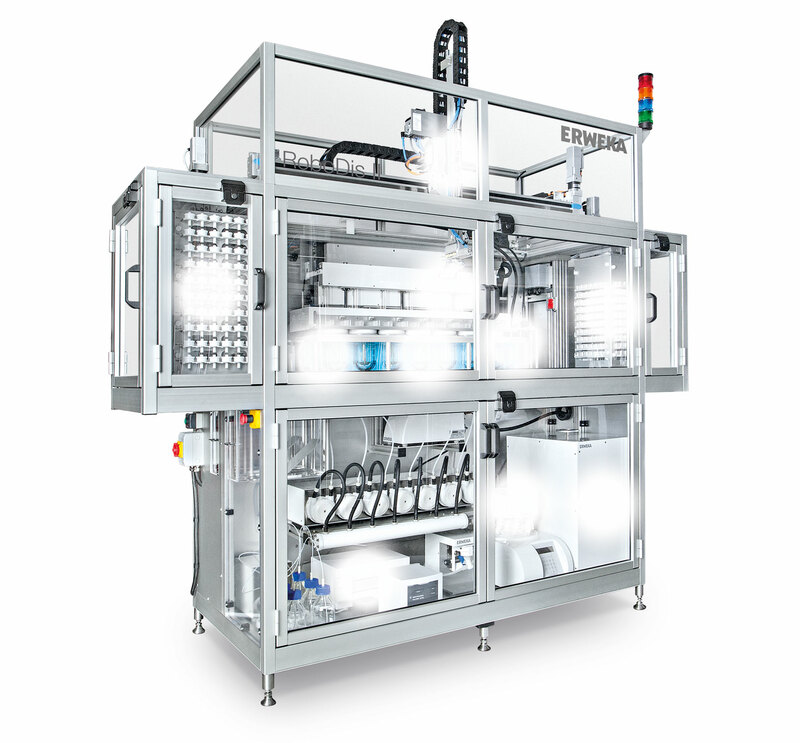 One-week professional installation and commissioning of your RoboDis II through our certified ERWEKA technicians. We offer the proper performance of the necessary qualifications for your RoboDis II. 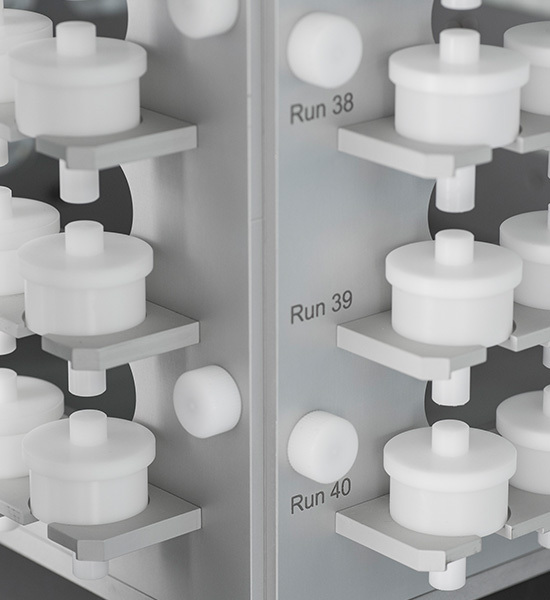 Preventive half-yearly maintenance services ensure a long lifespan for your RoboDis II. Hands-on courses and training provide profound user knowledge. Personal advice and direct clarification of questions via our 24h RoboDis hotline. 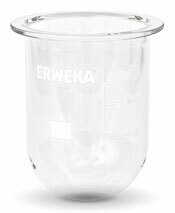 Reliable, quick repair service through our highly qualified service employees at ERWEKA or your site. 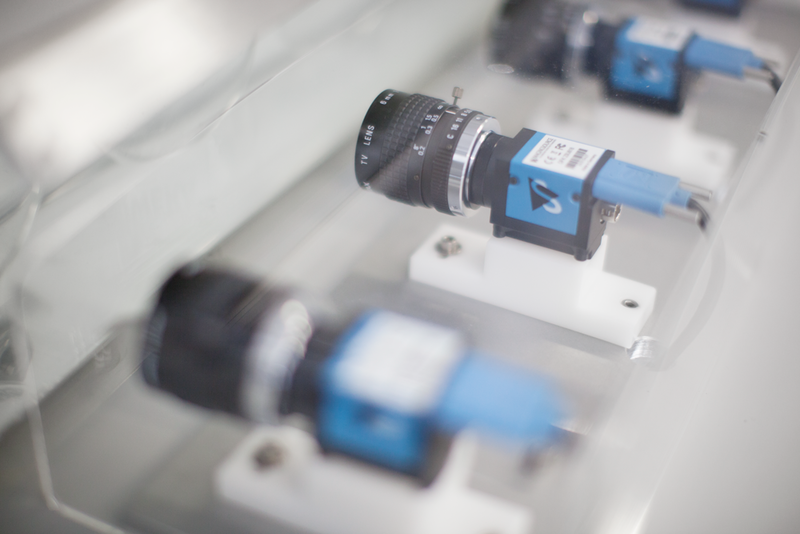 We offer customized service contracts with which you can ensure the durability and high precision of your testing equipment and maintain control of your operating costs for years to come. We have a powerful and global service network of highly skilled and experienced service employees. Massive throughput for maximum time reduction. 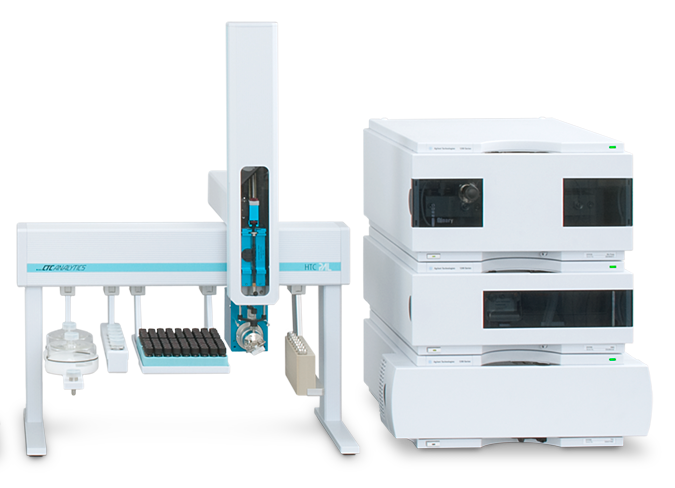 Versatile methods and full support for pH changes according to USP. Handling of sinkers up to 34 mm & "japanese sinkers"
Massive time reduction thanks to integrated media preparation and cleaning routines. Broad support for different kind of analysis devices. With 40 batches and video recording. 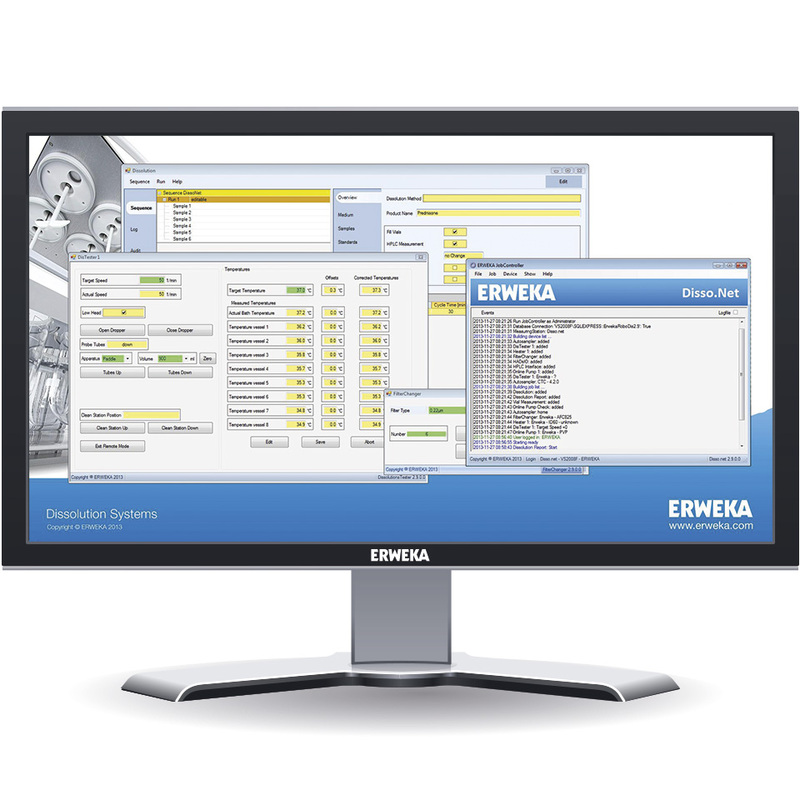 User-defined reports via "Crystal Reports"
Get an impression of the ERWEKA RoboDis II. Plastics tablet holding containers with magnet and additional lid to prevent moisture influences. A light sensor verifies every robot arm action, e.g. if he really grabbed the tablet container, if a lid is mounted, if basket is available etc. Rotating magazine for 40 batches of Poroplast inline filters. 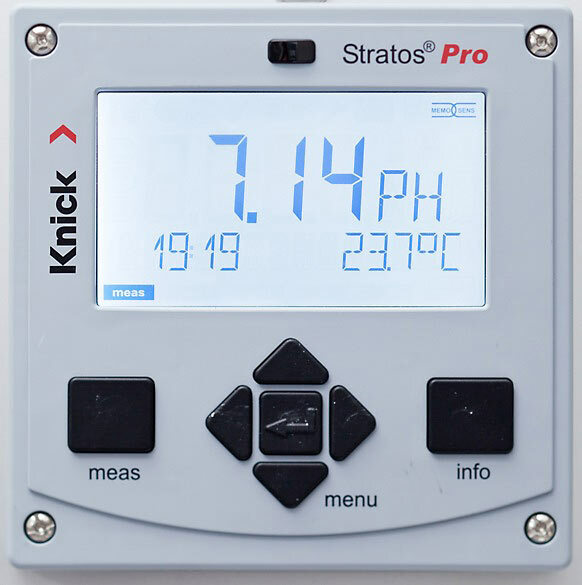 Two different pH meters available, Knick and Metrohm. Download our brochure for more in-depth information.